Your tower will look like new and have a long-lasting, durable coating when you hire us as your tower painter. Whether it is your city’s water towers or radio towers that could use a fresh coat of paint, finding a qualified tower painter can be a difficult task. Not only do you need someone who knows what to do when it comes to updating the aesthetic of these important landmarks, but a tower painter must also produce great results and know how to get a great long-term finish. How do you know who to hire to do a good job? Like many local municipalities, towns, or cities, your community may not have the resources to have a local tower painter on staff, or even know of anyone nearby to provide this important service when the time comes for a fresh coat of paint. 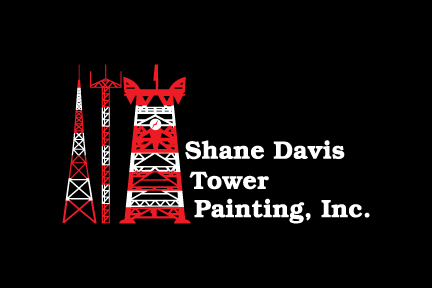 At Shane Davis Tower Painting, we have been providing quality tower painting services for 35 years, so when you need a qualified tower painter, our team is your top choice for the job. As a national tower painter, we understand that different towers have different needs based on age, weather, and other external factors. We come to you with years of skilled workmanship at our disposal, and we offer several services to ensure that your tower painting project has the best results. Spray Painting – Our spray painting service allows us to provide streak-free, uniform coatings with every tower that we paint. Your radio and water towers will look like new and have a long-lasting, durable coating that looks great against the skyline of your community. Sandblasting & Rust Removal – Just because your towers have been a staple in the community for 50 or 100 years doesn’t mean they have to show it! If your towers are old and showing signs of weather exposure, we can make them look like new with sandblasting and needle gun rust removal. This also helps in the painting process by giving the tower a fresh surface. Precision & Efficiency – Our team is trained to provide quality workmanship, and as your tower painters, we are committed to precision and efficiency with each tower painting project we complete. You will see a marked difference in these functional community landmarks when our painting services are finished. As your tower painter, we are committed to using the proper protection during the painting process. We come with all of the gear necessary to keep our employees and local citizens safe while we work. Our business isn’t tied to a specific location, which means we can conveniently travel to your site to provide a range of tower painting needs. Your towers will look like new and will withstand the test of time when you call us for our tower painting services. If you need a tower painter for landmarks, water towers, or city rooftops in your municipality, town or city, contact us at Shane Davis Tower Painting. You’ll receive a complimentary consultation over the phone, and your free quote will help determine the next steps based on your needs. We look forward to making your landmarks look like new.